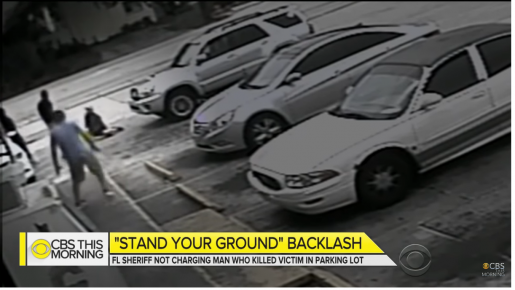 “Let me be clear: It is the policy of my office to comply with and abide by the stand your ground law,” Polk State Attorney Brian Haas said. (Anastasia Dawson, Dan Sullivan and Tony Marrero, Tampa Bay Times) A Lakeland city commissioner surrendered Friday to face a second-degree murder charge in the Oct. 3 fatal shooting of a suspected shoplifter at a military surplus store. Michael Dunn, who has served on the City Commission since January, arrived at the Polk County Jail in Bartow shortly after 6 p.m., accompanied by detectives in an unmarked car. At a news conference a half-hour later, Polk State Attorney Brian Haas said he doesn’t believe the killing of 50-year-old Christobal Lopez was premeditated. But he also doesn’t see grounds for a self-defense claim. So he took the matter to a grand jury, which indicted Dunn. Dunn did not answer questions shouted by reporters; nor did he make eye contact. He looked somber, his head bowed. His hands were cuffed behind him. He was fingerprinted, searched and ordered held without bail. He could make his first appearance in court this weekend. If convicted of the charge, he could face up to life in prison. The indictment came five days after surveillance video of the fatal encounter was released to the media. Dunn, 47, reported seeing Lopez pocket a hatchet the afternoon of Oct. 3 inside the Army Navy Vets Surplus store that the commissioner co-owns in Lakeland. Lopez, an agricultural laborer, had entered the store with his father, police said. Dunn asked Lopez if he was going to purchase the item, police said. Video from inside store shows Dunn holding a gun in his right hand as Lopez tries to advance toward the door. Dunn pushes Lopez with his left arm, and Lopez tries to leave again. Still pointing the gun at Lopez, Dunn grabs at Lopez’s shoulder from behind, as Lopez makes it out the door, the video shows. Lopez raises his left arm in an apparent attempt to break free, and Dunn appears to fire. Lopez falls to the pavement. Dunn’s attorney, Rusty Franklin, has previously told reporters that Dunn was justified in shooting Lopez because he was holding a hatchet during the scuffle. In the video, an object is visible in Lopez’s right hand. Just nine days passed before the Lakeland Police Department referred a criminal complaint affidavit to the State Attorney’s Office, Police Chief Larry Giddens said, joining Haas at the news conference. “In those few days,” Giddens said, “the scene was processed, all witnesses were interviewed, the victim’s family was interviewed, the defendant’s statement was obtained, multiple reports were written. The arrest came 16 days after the shooting. Giddens said the two agencies exercised the “utmost care” and strove for transparency. “Although this investigation may have taken longer than some would have liked, we had an obligation to do it right and that is what we will always do to ensure that the citizens of this community can continue to have faith and confidence in us that we have earned over these past few years,” he said. Giddens said the commissioner was taken into custody at his attorney’s office Friday afternoon and was cooperative. The Bartow Police Department assisted two Lakeland detectives with the arrest. Dunn is an adamant supporter of gun ownership who hosted a July rally at his store to counter a nearby March for our Lives rally on the same day. His attorney has not responded to telephone calls, e-mails and messages about Dunn from The Tampa Bay Times. It was not immediately clear whether Dunn would remain on the City Commission while he fights the criminal charge. Haas said the governor’s office was notified of Friday’s charge. Florida statutes allow the governor to suspend an elected official arrested on a felony or misdemeanor charge “related to the duties of office” and remove them if convicted. An attorney for the dead man’s family, Adam Kemp of the firm Morgan & Morgan, released a statement on their behalf. “There is no way to undo the life-shattering harm that Mr. Dunn caused, but we are pleased with the grand jury’s decision for such an unnecessary and egregious use of deadly force,” Kemp said. “We want to thank the State Attorney’s Office and the Lakeland Police Department for their swift and thorough investigation. Lopez’s family was laying him to rest in Zolfo Springs on Monday as local news outlets were reporting the release of the video. A funeral notice states that he was born in Arcadia and had lived most of his life in Hardee County. ©2018 Tampa Bay Times. Distributed by Tribune Content Agency, LLC.